Time to open up the Halloween Blog for commenting! 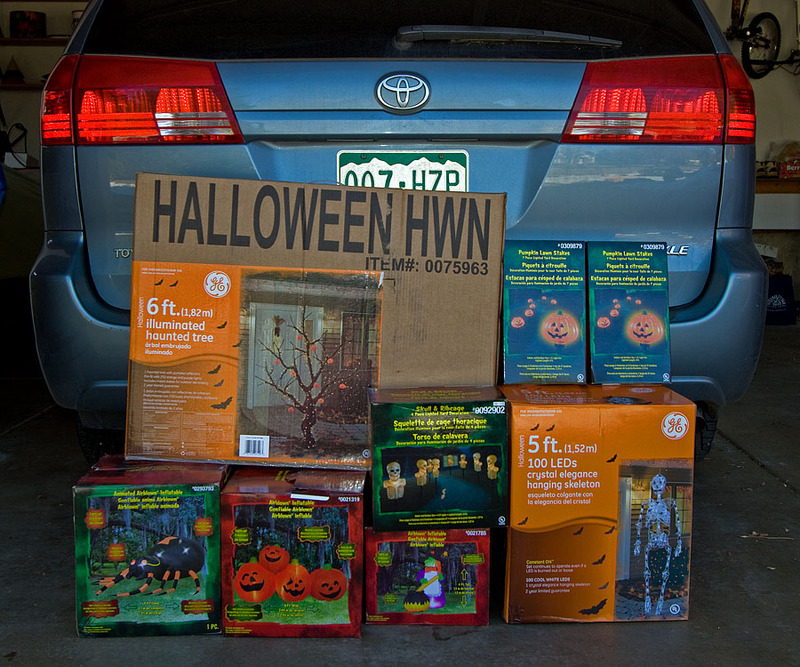 I took a break in 2010 due to some personal reasons (wife had Breast Cancer and Dad passed away) but all the Halloween Decorations are getting restless in my basement crawlspace. I very recently had Cataract Surgery w/Crystalens and despite the Hulk Gloves pictured below, still have some restrictions. But I hope to start setting stuff up in a few weeks and have the Halloween Webcam up and running by mid-October. So expect to see (and turn on&off) all the stuff (and more) that was seen in 2009.
hope your eyes are doing okay, my son is going to flip when i tell him your going to put up the halloween lights, he loves your christmas lights, he watches every night, thanks again alex for all your good spirit of the season, hope your wife is doing well also. YAY! :) Halloween is back! Alek, do you have any advice for setting up a Fog Machine, as far as location, effect..? I'm doing some spooky, scary music and sound effects as well. It feels good to be back!! October 1st is Saturday!!! Wishing you the best. I'm glad to see that you'll be up and running this year. Hey UV Man! Saw your Slashdot article! so are you going to have anything new this season? perhaps a 4th webcam? Alek replies at 20:49 - Doubtful there will be a 4th webcam ... but here's the haul from the last post-holiday 50-75% off sale ... so expect to see some of this in the yard and/or on the house. Hope your feeling better Alek! Love the fog machine idea! Alek replies at 08:11 - Chief Holiday Display Designer Kyle and I started pulling things out of the crawlspace last night ... and here's what the tree looks like when assembled and lit up - should look cool on the front lawn! Funny, Alek I saw that Inflatable Spider up here in Walmart. they're selling it for $19.99. we are considering it. that tree looks cool. Oooh! That tree is really cool! Alek replies at 19:46 - Should be live by the end of the week as lots of progress was made this weekend. Pulled all the inflatables out of storage, tested 'em, and mounted on plywood ... so they are ready to go. Halloween Helpers Drew, Kyle, and Jeffrey are pictured below ... mouseover image to see Jeffrey (who was the main helper) and I at sunset. Oh my gosh, I keep checking back in every couple of hours or so to make sure I don't miss anything! It's almost too much to bare. Alek replies at 08:00 - I've put Webcam #2 online. You can see the tree lit up over on WGG cam. Defiantly know its major holiday season coming when Alek's Lights kick into gear! Makes my year every year! Hey Alek! Brilliant to see the halloween decorations back up and running again this year! Sorry to hear that your dad passed last year, i hope wendy is feeling better now. Hope dirk and kyle are doing well, happy halloween! Hehe! Cute pics! These kids are growing like weeds! is anything going up today alek? Hoping to turn everything on by this weekend. Hello, Halloweenies, just bumped onto your website. want to see some really really spooky ideas here. Webcam number two showing Alex moving many things to front lawn. Webcam number one is online, but just pointing at the garage. Is alex up to something? Alek, did you get any footage on webcam 2 of the neighbours tree getting TP'ed? Alek replies at 12:45 - I've uploaded that time-lapse video to the Halloween Movies page. Kids are biking through the Halloween decoratons - get them Frankie! Looking good alek - U going to turn the controls on tonight? Looks like cam 1 went out?? As noted on the main page, I hope to turn on the X10 controls tonight even though a LOT more stuff to put up ... plus many things still to be tested ... such as cam1 which is being a bit flakey! Mouseover first image to see 5 minutes earlier before they got inflated. Where did you find the LED skeleton last year?? I think it is grand!! Alek replies at 08:13 - That's pretty funny ... and yea, hard to say ten times fast! Kids were having a garage sale (getting rid of some old toys) while I was doing some Halloween setup - here's the time-lapse. So glad to see you back Alek! I hope you and your family are doing well. Decorations are looking awesome as usual. Hope everything is going well in your neck of the woods. Alek replies at 09:44 - I usually put the HULK's out last ... because once they are on the balcony, it's hard to get around the Big Green Guys - should go up today or tomorrow. Here's a picture from a few days ago of Jeffrey helping me pump 'em up - obviously a big difference getting inflated. Alek replies at 05:33 - Check out some of the how-to/history videos here. Must be nice to wear light clothing in Mid October hey Alek? 91 degrees today in Arkansas. But the weatherman says a big change is coming and we might get our first frost next weekend.... FINALLY some cooler weather! The XTB-IIR/III (pictured below) seems to have addressed most of those issues with a single box in the Haunted Office. While there is still one circuit which is erratic (in the master bedroom), that's easily solved by placing a second transceiver there. Besides that, everything has been rock solid. If you are an X10 user, I strongly encourage you check out JV Digital Engineering - Jeff Volp makes some great products (the craftsmanship is exquisite) and is a genuine pleasure to work with. is there any way i can load the page with the music?? Do the Hulk Bro's have Wonder Twin Powers? where abouts is cam 1 alek? surely on a streep lamp or somthing like that? and how does the signal reach that far? or is it cabled? Alek replies at 18:31 - The webcam is standard 802.11 wireless. Good News: I moved Webcam #3 (in the Haunted Office - it has a broken gear so has to be manually pointed) to Webcam #2 (looking at the front lawn). I was then incredible lucky to be able to borrow an older D-Link DCS-5300 webcam from Andrew Batson at Brass Key Colorado Real Estate Property Brokers who I had helped setup a webcam for when he built his house. While the field of view and image quality are slightly different than the DCS-6620G (plus the camera forces a timestamp on the image) it works "good enough" so people can watch what's going on in the Haunted Office and the Instant Messages on Laptop. A HUGE thumbs-up for Andrew! Why am I looking for the "like" button after reading the update about the camera? Dang! That stinks about your camera dying. Those puppies aren't cheap! Really glad you are back this year Alek! Hope your wife is doing well, and it sounds like your surgery was a success. Any cool suggestions for Christmas gifts for my engineer husband this year? That light cube was a HUGE hit last year. Can't wait until tonight, I am in UK and just broken up for half term! it would be really cool if there was some kind of live x10 controlled gauge in the front yard to show how many people were using this site. BTW its looking great again this year Alek! Alek replies at 15:54 - That would be cool ... but I'd need a darn big set of lighted numbers to show that. Here's a picture of the front of the house at sunrise ... the image quality of the Canon 7D is a bit better than the webcam! Got an iPad 2 today!! Site looks deadly on it! Would be cool if u hooked the webcams up to a DVR and streamed the video .. Pricey tho! New decs this year !! In the first picture, I did a "multi-LED light-paint BOO" as the 86 second exposure was taken at F/4 and ISO800. In the second picture, I used a flashlight to light up the house and Halloween Decorations in a 51 second exposure at F/5 and ISO200 with some adjustments to the White Balance. Cool Picture. Who is the standing dude? Love the Werewolf! Looks like he shops at REI. Hehehe! Alek replies at 12:45 - Here's what he looked like this morning - mouseover image for wide-angle view. While it's only a week before Halloween, remember this is just the warm-up for Christmas ... so I have re-enabled commenting on the Christmas Blog. Lets hope better luck with the X10 system tonight! Alek replies at 09:50 - I tracked down and confirmed the problem was with a bad TM751 X10 wireless transceiver. Popped a backup copy in there and everything looks good now. Sure having your share of issues this year hey? Good thing they're being fixed before the big Christmas season. Look at it this way, sooner or later things break. Someone just moved cam 2! Fingers crossed tonight is a good one! There is no snow coming up north here in Alberta Canada. They have no idea yet when it may hit. X10 is working well tonight - pretty sure I isolated/fixed the problem. Yea, code is all hand-written Perl (with Ajax) running on Linux/Apache. Here's a picture from the vantage point of webcam #2 - mouseover image for closeup of me and Mr. Werewolf. hey Alek, are either of your kids interested in Sports? are they going to play any when they are able to? Here's a picture from the vantage point of webcam #3 in the Haunted Office. Mouseover image to see another picture of (pirate) Kyle and I in the Haunted Office. Snow! Wow!! Must be nice. I love cold and snow and all that good stuff. It's in the low 80s here. Going to get cooler by the weekend though (thank goodness!). Uh Oh... Cam Down... Alek how much Snow did You get in the end? Alek replies at 12:18 - Yea, looks like the new webcam I got is having some issues and the manufacturer agreed it's got something wrong that a firmware re-flash and factory reset didn't fix. Scrambling for Halloween as I work on an exchange. We got about 10" of very heavy, wet snow ... lots of down'ed branches ... but the Grim Reaper is looking styling riding his motorcycle across the snow! Brilliant Photo Alek... Love The Reaper! Thanks for Sharing Won't the Tree get Damaged with the Weight of the Snow? i go away for a few days and come back and there is loads of snow WHAT! p.s will the cams stay live now until christmas so we can see the setup? Wish there was a "like" button for your photos! Here's a couple more pictures from the ten inches of very heavy wet snow that fell on Wednesday - watch video. And here is what the warewolf looks like in the snow - mouseover image to see gnarly closeup! I still find it amazing that I can turn you lights on and off, in Colorado, from my bed in England. Here's a video of Kyle in action - be sure to watch in HD. Re: "Anonymous" from 090.195.062.050 - Source code is always out there and is part of any web page, just right click a page and view it, That's It! It likely Won't work though as it is customised to all his local directory's within his Apache + other files such as his .js files. Alek, how can someone possibly overload your site 143,000 times in one night? That is a bit ridiculous don't you think? Perhaps this person should be banned. Alek replies at 5:58 - Yep, it is a bit ridiculous - someone wrote a "BOT" to flood the website with X10 requests. Among the various mechanisms in place to handle this is a limiter such that once you hit a reasonable numbers of changes for the day, subsequent X10 requests will be ignored. Roger Fillion put together a nifty slide-show of "10 Halloweeen Haunters" which features yours truly and hits the front page of MSN.Com. It was a pleasure working with Roger, and I especially got a chuckle when he forwarded the following question from the MSN folks - "Does Komarnitsky mean he concedes control of the lights and effects to anyone accessing his Web site? Operationally, that can't be possible; what would prevent chaos - a potentially dangerous chaos given the electricity he needs?" To which I replied: "Short answer is YES - people on the Internet have complete control! Long answer on the "dangerous" question is the total current draw is 35 Amps (8,500 lights) which is about the equivalent of two hair dryers. This is spread out over a number of circuits (all on standard 15 Amp Breakers) and which are all under 10 Amps draw. Everything outside is on a GFCI. So having this go ON/OFF/ON/OFF a bazillion times a night is really no different than a kid toggling a light switch - albeit in this situation thousands of 'em. Although yes, it is a bit chaotic with everything going up/down/on/off ... watch some of the Halloween time-lapse Movies! ;-)"
Booo from Ct. It's snowing here now. You did a great job decoratng - I am a child at heart. Thanks for all of the work you put into the display and for sharing on the web! It's getting warmer each day so the snow is melting fast - supposed to be 65°F on Halloween ... so the Grim Reaper will be "riding" again sans snow! Hello from Europe. Can you PLEASE turn on early tonight. I saw your website on MSN and I want to trick or treat at your house! 600 (!) pieces of candy (I'm not stingy), six pack of Pumpkin Ale, 5 bottles of "organic three buck Chuck" from Whole Paycheck Foods, Bottle each of Ruby and Tawny Port, Peppermint Mocha Kahlua (quite good actually), and large bottle of Irish Cream. Hi From The UK. I Am A Big Fan Of Your Blog And Webcams. I Think It's Great What Your Doing For Your Family And Kids And Your Really A Big Insperation. Here's a wide-angle view of what the trick-or-treaters tomorrow will see before it gets dark - mouseover image for closeup view. yummy Drinks Alek! So any final preparations before the big night tomorrow? Alex is fixing up the lawn for tomorrow. He was working on the Pumpkins and now they are inflated. As neighbors, I have to thank you for the entertainment. My children - ages 1, 3 & 5 - are obssessed with your house and demand that I drive by (not our usual route) whenever coming into or out of the 'hood. They often chant your name as we pass by and have vocialized a diesuire to 'live with Alek and Wendy.' We also have taken to an almost nightly bike ride or stroll to see the house up close. Fun! If I posted a FAT LADY picture of my wife on the web, I wouldn't get s** for a month! Happy Halloween everyone from Hungary !!!!! HAPPY HALLOWEEN ALEK & FAMILY and ALSO HAPPY HALLOWEEN TO EVERYONE.....Trick or Treat!!! In hopes that Alek's Halloween Decorations would be there. I knew in a moment it must be Alek's Controllable Halloween Decorations for Celiac Disease. The continuous turning ON and OFF of each little light and giant inflatables. Ensuring the laptop chat-room stayed family friendly to bazillions of people around the world. Plus passing out treats to all who came to his door. "Happy Halloween to all, and to all a good-night!" Alek replies at 18:01 - It just won't stand back up after being inflated ... so it's on a permanent ON circuit. Just saw first trick-R-treater - been hundreds in past years. I saw many people on the cams tonight. The mobs of trick/treaters have dissipated. sorry Mom the mob has spoken!.. Monorail.. Monorail!.. Monorail!!! Thanks for another awesome Halloween! Not sure you realize how much many of us appreciate your effort. Really looking forward to Christmas with you. Had a good crowd tonight although seemed a bit slower than last time despite the nice weather. Both Dirk and I estimated between 150 and 200 people stopped by. The first picture is yours truly with the giant bowls of candy. Second picture shows my son Dirk passing out candy. And the third picture is when Sumo Kyle returned from trick-or-treating. Good Luck and Good Night.. Take Care! Alek, thanks for a awesome Halloween, see you at x-mas! Time-lapse video from the Halloween evening from webcam #1, #2, and #3 are now posted on the Halloween Movies page. Below are some screen grabs showing the different views - sorry the image quality isn't quite (!) as good as my Canon 7D. Wish you could leave web cam #1 up so we can see you taking the stuff down! Do the lights come down today or will they be up for one more night? Alek replies at 08:19 - I've already started taking 'em down as seen on webcam #2. I'll turn on webcam #1 when I do the front of the house ... and make some time-lapse movies of it - goes pretty fast! WHOA! That was quick! Then again I just looked at your weather forecast. You're smart to get everything down! THANKS AGAIN for your Awesome Display!!! Hello my name is Vincent halgrain I love your webcam 1,2,3 I had a great Halloween thank you. Thanks for another season Alek, looking forward to the Christmas lights in a few weeks ! Would it not be easier to leave the icicle lights up since there going up in a few weeks.??? Alek replies at 10:56 - Yep ... and the icicles lights are the one item that is left up for that exact reason. Hope Halloween was a huge success! Can't wait for the Christmas decorations! Another halloween done! Looking forward to Christmas! I forget to say that as I loved the Halloween decorations that I have a good Halloween I devote provides the link from my website LINK DELETED thank you was soon. Great lights this year, Alek. Looking forward to Christmas. Looks like the snow you were talking about is already here! Crazy - Halloween, temp is 70, 24-36 hours later, the ground is snow covered! Gotta love the crazy temperature swings!! You're always GREAT!!! Alek. See you on xstmas time! Thanks for all the positive comments and yea, Old Man Winter came in strong today as we have almost a foot of snow on the ground. Good thing I got everything taken down and put inside the house yesterday - check out the check out the time-lapse movies here. As I was taking things down, a couple of giant front end loaders drove by - they were sweeping the neighborhood of all the piles of broken branches from the storm a few days ago. Weird how webcam 2 is disabled on here, but not on "watching Grass Grow". As you can imagine, the HULK takes a long time to deflate, so I just laid him down on the back patio ... and he was buried under the foot of snow that came down last night. But it's pretty amazing what the warm Colorado sun can do ... so in the picture below, it almost looks like a white poofy blanket. Hulk looks like an iced cookie! LOL! Alek replies at 10:53 - There's a variety of "switch-over" things to do once the webcam shuts down. I missed that one - fixed & thanks! thanks alek it was great again !!! greetings from hungary, meet in christmas !